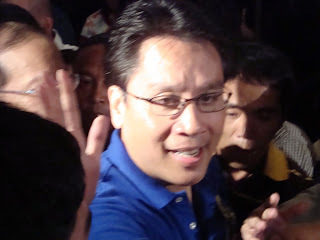 I JUST came home after attending the press conference of Sen. MAR Roxas at the Club Filipino this evening. Like many who have supported his bid for the presidency in 2010, I feel a tad depressed. I sincerely believed his record as a government official - having been the secretary at the Dept. of Trade and Industry - and the number of legislative bills he has been able to shepherd into laws, speak volumes of his mettle as a leader. But this evening, he announced that he was bowing down and putting "country above self," and supporting his friend since birth, Sen. Noynoy Aquino, for the latter's bid for the presidency in 2010. Not the one to be insensitive to public sentiment, MAR put aside his own interest to respond to what the citizens want. There was a public clamor for Noynoy, and so MAR stepped aside. And he is a better man for it. This is the ultimate sacrifice for any politician, and harks back to the same sacrifice Doy Laurel made in 1986 when he agreed to run as VP under Cory Aquino. MAR has vowed to support Noynoy and stand beside him through this tough race where they are pitted against the "festering evil around us." So it is almost a certainty that it will be a Noynoy-Mar tandem for 2010. While I admit to having certain doubts as to Noynoy's preparedness for the job as president, I have been saying all along that the Opposition must be united in 2010 to fight the common enemy, the Palaka/administration of the presidentita. With Tita Cory's death reawakening the Filipinos' hope for change and getting themselves more involved in the political arena, Noynoy can very well harness this to help him win the presidency next year. And if this is the only way to beat the b**ch, then I am now 100% behind this tandem. Hopefully, all the other opposition candidates will make the same sacrifice that MAR has made and support this formidable team. They have to come together and chase the evil one out of Malacañang. What Senator Roxas did tonight was unbelievable. His sincere gesture (if it is sincere, and I do not doubt that he is) somehow makes me feel like there is still, after all, hope for the Philippines. I hope that Filipinos take note of this selfless act and place "country above self" in the coming elections. It was a pragmatic decision and a very graceful exit! No sacrifice here, excuse me! I hope and pray that more politicians take the cudgel of sacrificing self over country! It's time for men of integrity to take the reins of government and bring back the meaning of dignity into government service. Bring back the hope that we will have men of integrity into our nation's leadership! @Anonymous 10:53 am: If you've been a keen observer of politics, you will know that being at the bottom now, leaves so much room for a candidate to move up. Bet. now and May 2010, if Mar had pursued his candidacy as president, his ratings could've gone up w/ a focused campaign and correctly-targetted publicity. This was exactly what happened in the senatorial elections. Mar started off at the bottom as well and ended up topping the elections when all the votes were tallied. But thank you for expressing your opinion on what Mar did. I know a few people feel the same way as you, and I hear you. Thanks and do drop by again.